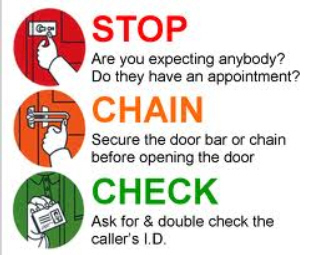 Police Scotland have launched Operation Monarda to help protect against bogus callers & workmen. Report any incidents of bogus callers or rogue traders in your neighbourhood. Share the advice below with vulnerable friends and family. Lock your doors whether you are in or out. Don’t allow in any callers who haven’t made an appointment. Fit a chain or, ideally, a door-bar to allow you to open your door a little to see who is outside. Fit a peephole to your door to let you see who is outside without opening the door. If you don’t have a peephole you can answer callers to the door from a window. Do not accept ID badges as proof of identity as these can easily be forged. Look out for your neighbours and, if something seems wrong, contact your local trading standards office or Police Scotland. Don’t worry about seeming rude. Genuine callers expect you to be careful. How to avoid being taken in by bogus workmen. There are individuals & companies out there who specifically target our elderly and most vulnerable people in our communities. Bogus callers use many methods to extract or steal money from their victims. They can pretend to work for a legitimate company, use distraction techniques or use unscrupulous working practices. Here is some advice for householders. It is perhaps best to use a company that has been recommended by a relative, friend or neighbour rather than any companies who "cold call" attend at your home uninvited. Always use companies who have a telephone landline and business address. But be wary of numbers that appear local. These can be bought and re-routed to a mobile. Get a definite price for the work that is to be completed and what exactly that price entails. Ensure a contract is presented and that you thoroughly read and understand the contents. Do not make a decision on the day - not even if they use pressure sales technique saying they can only hold the price for that day. Do not pay any money until you are satisfied with the standard of the work that has been completed. Consider having a friend or a relative with you when speaking with the representatives of the company. If workmen attend at your home and you are unsure as to their identity do not open the door. You can speak to them via a window or use a door chain or bar. 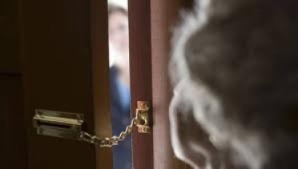 Neighbours - always look out for the elderly or vulnerable in our communities. If in doubt, residents are advised to contact Police Scotland on their easy to remember number 101 and ask for advice or to report an incident or cold-callers operating in your area. If you wish to remain anonymous telephone Crimestoppers on 0800 555 111. Download the Bogus Callers & Workmen information sheet .